I was clearing all the cluster in my wallet tonight, and found this credit-card-size card written ‘SUBE’. It took me a little while to remember what it was. 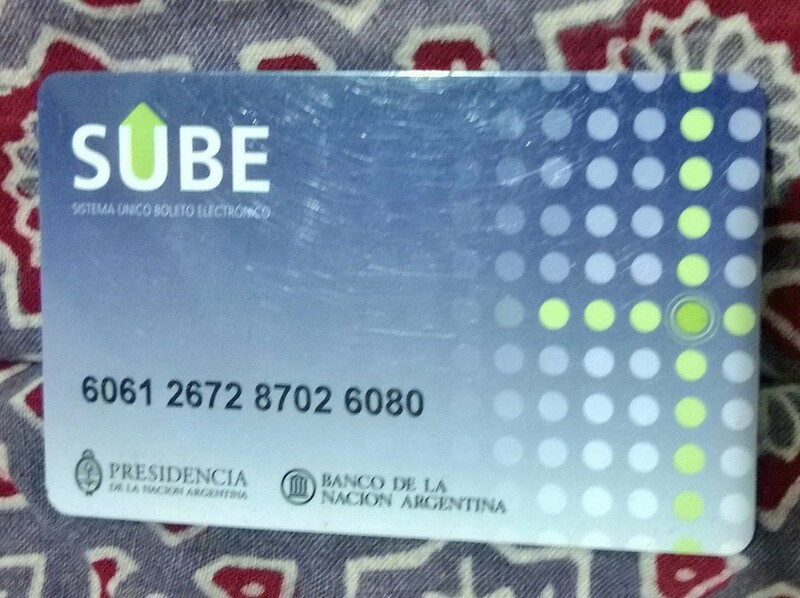 It was the public transportation card in the city of Buenos Aires (or BsAs as affectionately called by the locals) that I bought when we spent 3 weeks there back in February. it’s the equivalent of OPAL card in Sydney (the new invention while we were away!). Memories flooded back when I saw the card. The card was a life saver, once we managed to finally get one. Theoretically all major metro stations and big grocery shops in BsAs would sell it. It took us almost a week to finally find one. Theoretically a free card, we paid an equivalent of 3 dollars for it. Why? In a country where rules were not written, and you were not far away from being illiterate as far as spoken language was concerned, we learnt to accept that some questions would remain unanswered forever. Well, we paid 6 dollars as we bought two, and only a few days before we left the city we found out that multiple people could use the same card even for the same trip. In metro station you simply swipe twice when you got it. On the bus, you had to tell the driver where you were going when you got on, and the driver would key in the correspondent amount. Well, why were we so eager to getting hold of the card anyway? Because it was an excise of driving us insane not having one. The bus/metro fare were very cheap in BsAs, but how the fare was calculated was still a mystery to me. The worst part was that the fare almost always involved some weird number, such as 3.83 pesos, 4.22 pesos. And you had to have the exact amount of changes with you because the drivers were not supposed to give back any change. So we would collect all the changes we received from each grocery shop (only big supermarket wouldn’t be angry with you if you didn’t have the exact change, so go figure how painful it was to collect some small changes), and preciously put them into our pockets and wallets and backpacks, as if they were the treasure of our lives. What’s worse, the value of different coins and bills in Argentina were notoriously difficult to decipher (due to very similar colors to my taste), so sometimes when we were trying to compose the right amount of bus fare, a long queue would form behind us. On a hot summer day, I felt quite guilty of making others wait in the sun, although inside the bus often it wasn’t really any better as most buses were not air conditioned. So we were very happy when we got the card. We hoorayed and jumped as if we won the lottery. So what happened to the second card we paid for unnecessarily? Well we gave it to a couple we met in Cuzco/Peru who were going to BsAs afterwards. During our trip, we had been on the receiving end of random kindness for so many times, and we tried to do what we could to be on the giving end, even if it’s just as little as a SUBE card. It could just save them a week worth of frustration trying to get one. If I had this SUBE card with us at that particular moment, I would have given it to them too. I had no idea how it ended up staying in my wallet till now – it’s perhaps the only non-essential thing from the trip staying in my wallet. But I’m glad it did, because memories flooded back thanks to it. I could almost tag this post ‘nostalgic’ – it was just 8 months ago when we just began our real adventure after the good old France. And it felt like ages ago. It’s more like a reminder that memories are often composed of all these little things. A card. A chance encounter. The feeling you felt at one random split moment. Some otherwise unconnected place/people/things that somehow became connected. It’s a reminder that the 461 pages of diary I managed to jot down on my phone – some days there was just a few words while other days there were a few pages – was perhaps one of the best things I’ve done during our trip. It was also one of the hardest things to continue doing. It’s also a reminder that I will continue to honour my own promise to put the relevant parts of that 461 pages onto this site. So that memories could be retrieved and relived, even after the SUBE card would be long gone. Next Article: So Where Did You Go?